I had no idea how do do any of this when I started. Here is how it all came about. I wanted to write a love song but as I met my true love at eighteen, my life made for a really boring song. Imagining heartbreak and singing about it seemed disingenuous and disrespectful to people who had had their hearts broken. So instead of writing a song about woman done wrong by a man, I decided to write one about a pet done wrong by an owner. Pets needed a voice and they couldn't write a song themselves, so that seemed like a good and useful love song worth writing. While writing the lyrics, I got to the line “Pet trash” and it just didn’t sound right. It had to be “Cat trash” or “Dog trash”. Female torch singers make me think of cats rather than dogs, so it ended up becoming a song and video about cats. After the lyrics were done, I realized they were too depressing to be paired with a typical bittersweet tune. So I cast about on YouTube to see how other songwriters had handled this and came across “Goodbye to Love” by Karen Carpenter. When I was a kid, I had always liked this cheerful sounding song on my Dad’s 8-track tape, but now hearing it again as an adult I understood the darkness of the lyrics. So I tried to write the most cheerful melody I could think of - the sort of tune you’d expect in an upbeat family friendly musical. My sheet music completed, I turned on my mike and sang. Then I listened to it. No amount of autotune was going to make me sound good. I needed to find another singer. After some false starts, I discovered backstage.com and posted an ad there asking for singing samples. Rather than just provide a sample, Diana Blythe Gelinas took the time to actually sing my song and record it as the sample and she had a live improvised piano accompaniment that was better than the piano accompaniment I had provided. The recording was a bit fuzzy, but the passion and the talent were obvious. And so, Diana got the singing contract. And I wrote an additional contract for Jamie Shaw, her vocal coach who had improvised the piano accompaniment. Collaborating long distance (I live in California and they live in Texas) worked out fine. I told them to feel free to change the tempo and improvise and I’m so glad I did - they’re amazingly talented and improved the song so much. Diana’s voice is fantastic - so much talent and so purrfectly suited to singing as the cat. Jamie’s final accompaniment is amazing - she went above and beyond what was in the audition recording. It has been fantastic working with both of them. The recording of Diana’s singing sounded great on the new microphone Jamie was kind enough to buy. However, the recording of the accompaniment was less than optimal as they had to record it with a synthesized piano. So that meant I had to provide the acoustic piano recording. 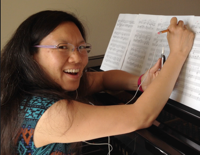 Tinkering on my piano, I learned to appreciate Jamie’s craftsmanship as I used Denemo, a freeware music notation program, to notate the piano accompaniment. Then I spent a month practicing playing the beautiful but rather difficult accompaniment and learning to follow Diana’s lead. I ported my piano recording into Garageband, added Diana’s singing and prepared to hear the computer do the magic to make it sound great! And ... fail. Apparently, mixing is an art form. In short, mixing is a bunch of geeky concepts you don’t really want to know about and the piano can’t compete with the singer for the same notes so the piano has to be sort of muted and muffled sounding. In hindsight, it’s good I recorded the piano with my cheap Roland R05 digital recorder rather than a more expensive setup because I’d have had to nerf the piano recording anyways. After a month of mixing tinkering, I wanted to make sure the song got up onto various music services before the video was done, so I started to submit it via TuneCore only to discover I needed cover art. Thanks to a fantastic photo of a cat on a road by Kenny Louie, all I had to do was add text to get the perfect cover. And so, three weeks after I submitted it, my “Road of Life” song was available on iTunes. But in the meantime, I was busy figuring out how to film the music video. As the song is about a rescued cat, it seemed fitting that the part should be played by rescued cats. I also wanted to make it with as many cats as possible, like a school play where every kid in class gets a line. That way it would be way easier to film because the cats have different ages and temperaments suited to different parts of the song, a specific cat getting adopted in the middle of filming would be no problem, and most importantly, more cats would be showcased and potentially adopted. I sent emails to local cat rescue groups and found OC Small Paws. They have been terrific and I really enjoy working with them. Very professional, very dedicated, and truly caring about their cats and cats in general. Mary Jacobs, OC Small Paws Vice President, was great to work with and she did a great job helping pick out which cats to film and helping with filming. All the filming was indoors inside the cat adoption room at Petco or Petsmart, at the vet, or at the foster's home. Those car and outdoor scenes are all green screened. So don’t worry - all the cats were safe all the time. The cats, of course, ignored the script and just did whatever they felt like. So we just took lots of footage and if what they did looked like it fit a line of the song, that’s what we used. 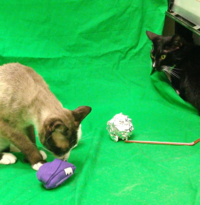 I didn't have a green screen stand, so we just draped the green screen cloth over a carpeted cat tree. Many of the cats had fun going under the screen into the "big green cave". 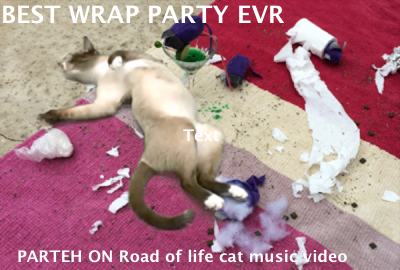 Much hilarity ensued during filming when the cat in front noticed the cat in back wiggling the green cloth and they would play with each other through the green screen. Jessica Colgan plays the part of the kind lady who rescues the cat. She’s an OC Small Paws volunteer who takes care of several of the cats and it’s obvious that she loves the cats and they love her. She's amazing with cats - she can literally walk into a room full of new cats and they will stop, look at her, and come over to say hello. She also helped drive and coordinate all the filming details and helped with filming and production. She is a joy to work with, and I couldn’t have filmed it without her. Special thanks goes to Chris Poole of Big Cat Rescue for being kind enough to send me footage of Ares the rescue cougar and allowing me to use it in the production. So from my experiences I have learned that if you have a dream, you should go for it. There will be many great people along the way that you haven’t met yet that will help you get there. Have a plan. And spend little money but spend a lot of time. A little perfectionism and thought go a lot further than just throwing money at something and you’ll get a better product and you’ll learn a lot.